I went into my local Wachovia branch this morning. 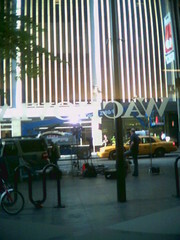 A Fox News TV crew was already positioned outside. There were only 3-4 customers inside, conducting, from I could discreetly gather, normal transactions. I was told that there are no news and that, after repeating question #2 a few times, and I paraphrase, "Don't worry, the government will take care of you. The government won't let anything happen to your/the bank's deposits." Seeing how Citigroup has already, you know, taken over Wachovia, and also how babies who need to be patted on the head and told that Daddy G will take care of them are not, traditionally, a bank's customer base, the information provided by the bank employee was useless. Bottom line: Not providing customers with basic, accurate information is not exactly a winning strategy in these turbulent financial times.